The EUP7220 is a dual-channel low noise, low dropout. High PSRR, high accuracy CMOS voltage regulator. Performance features include low output noise, high ripple rejection ratio, low dropout and very fast turn-on times. 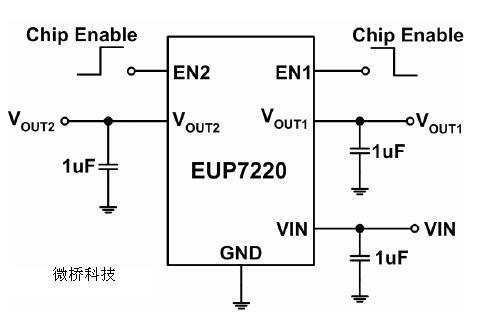 The EUP7220 is also fully compatible with low ESR ceramic capacitors, reducing cost and improving output stability. This high level of output stability is maintained even during frequent load fluctuations, due to the excellent transient response performance and high PSRR achieved across a broad range of frequencies. The EN function allows the output of each regulator to be turned off independently, resulting in greatly reduced power consumption. The EUP7220 is available in small 1.6mm×1.6mm TDFN-6 and TSOT23-6 packages.